It’s become a tradition for actor and comedian Jay Thomas to go on The Late Show with David Letterman every year at Christmas time. He always tells the same story, about how when he was just breaking into the radio business, he did an appearance at a local car dealership with Clayton Moore, who is most famous for playing the Lone Ranger on TV from 1949 to 1957. It’s a colorful story involving a car chase, afros, tight jeans, “hippie freaks,” a beat-up Volvo, and getting “herbed up,” and the punchline involves Moore, in full Lone Ranger costume, coming to the aid of Thomas and his coworker. If you’re looking for good Lone Ranger entertainment this summer, that’s what you should watch — not the new Lone Ranger movie that’s hitting theaters this week. Essentially a western for those who can’t get enough of Johnny Depp and his by-now-tiresome shtick, director Gore Verbinski’s overlong, overdone film shifts the focus of the legend, putting Tonto front and center, and Depp in the role under black-and-white makeup and with a dead crow on his head. The whole movie is told from Tonto’s POV about 85 years after the fact (don’t ask), so whether we’re seeing the “truth” or just Tonto’s version of it is up for debate. 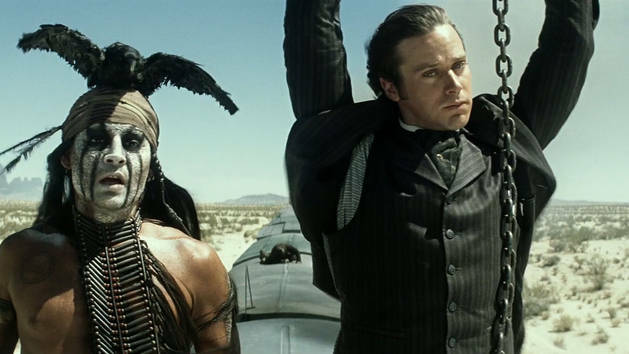 If you care to have such a discussion — spoiler alert: you won’t — the advantage will come down on the latter perspective for the simple reason that the movie recasts Tonto as the hero, while the Lone Ranger (Armie Hammer) is perhaps one of the blandest, least interesting heroes you’ll see in a movie any time soon. Here, he’s John Reid, a straight-laced, Eastern-educated lawyer who returns to his hometown to work alongside his Texas Ranger brother. But when said brother is killed, Reid (a so-called “spirit walker” because he escaped death) is convinced by Tonto to join him in seeking revenge against the bad guys. That pretty much makes the Lone Ranger Tonto’s sidekick. How do you like that revisionism, kemo sabe? Like most modern-day movies in this genre, the Lone Ranger is a reluctant hero. But Hammer, best known for playing the Winklevii in The Social Network, isn’t given much pathos or agita to deal with. Reid is just a man out of his element — and Hammer is an actor out of his league. He should be glad he’s wearing a mask. And Depp … well, it’ll take a strong director to tell him to tone down the quirks, and Verbinski, who made a worldwide star of Depp in the Pirates of the Caribbean movies, is not the one who’s going to do it. The Tonto character is based in waaaay outdated stereotypes, so it’s nice to see Depp play him as a strong figure with a brain, and not just as a subservient character. That said, he and Verbinski have swung the pendulum too far, and Depp has been given no limits on his mugging and scene stealing. This movie may as well have been called Tonto based on the way Depp’s performance overwhelms Hammer’s. Sure, Depp gets some laughs, but Lone Ranger marks a giant leap over the shark. Enough is enough. Let’s hope next time out (in whatever movie that is), Depp is reined in. It’s hard not to look at the movie overall as a cynical summer cash-grab for Disney, a high concept, star-driven vehicle laden with big-budget explosions and not much more to grab an audience’s attention. 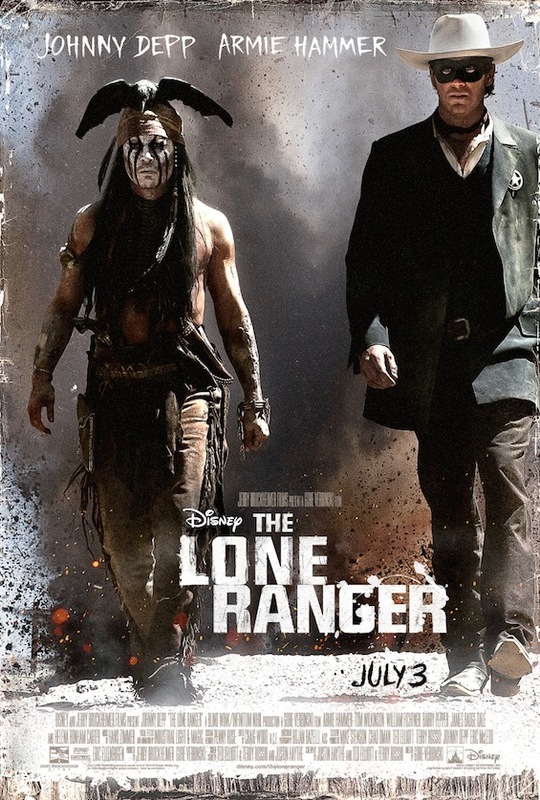 There is some periodic enjoyment to be had, but mostly, Verbinski trades in the noble legend of this Western hero for some cheap laughs and another one of Depp’s offbeat performances, and the result is a giant meh of a movie. Perhaps the best thing you can say about The Lone Ranger is that, surprisingly, the film isn’t in 3D. Thank God for that. Alright, fine. If I’m being honest, there’s something else: The famous Lone Ranger Theme Song (aka “The William Tell Overture”) still sounds great. It’s used here in the movie’s final moments to underscore a high-speed chase aboard a moving train, and the scene is actually quite exciting. That speaks more to the power of the music (and Hans Zimmer’s treatment of it) than to anything else, but I’ll give Verbinski at least some credit for ending the movie strongly, even if nearly everything that came before was less impressive. With a running time of just about two and a half hours, the film makes you wait a long time for that one scene. And I’m not saying it’s so good that it makes the movie worth seeing. But like Reid the character, The Long Ranger does eventually rise to the occasion. That, in and of itself, is heroic. It’s just not as much fun as watching Jay Thomas tell his Lone Ranger story on Letterman. I’m giving The Lone Ranger a C–. Which of Johnny Depp’s characters is your favorite? Share your thoughts in the comments section below.